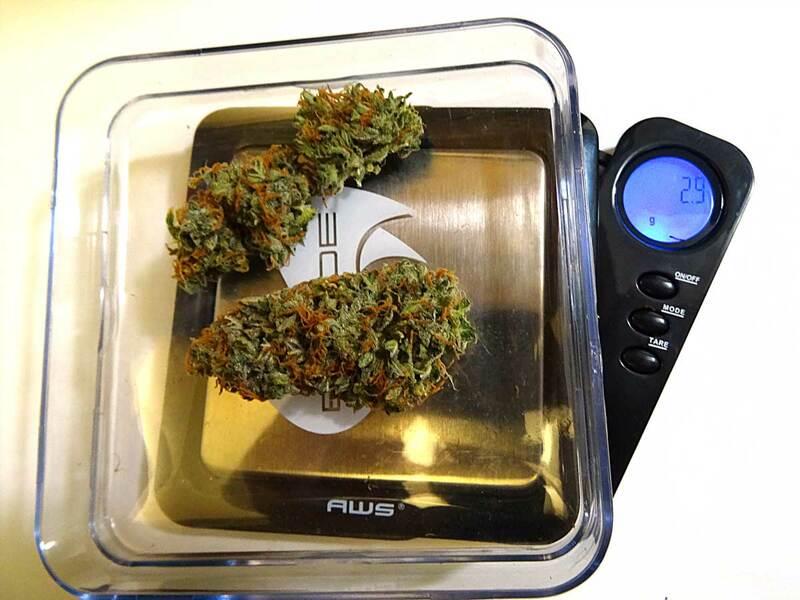 You are hereAuto-flowering Grow Journal - 6.7 oz under 250W HPS! 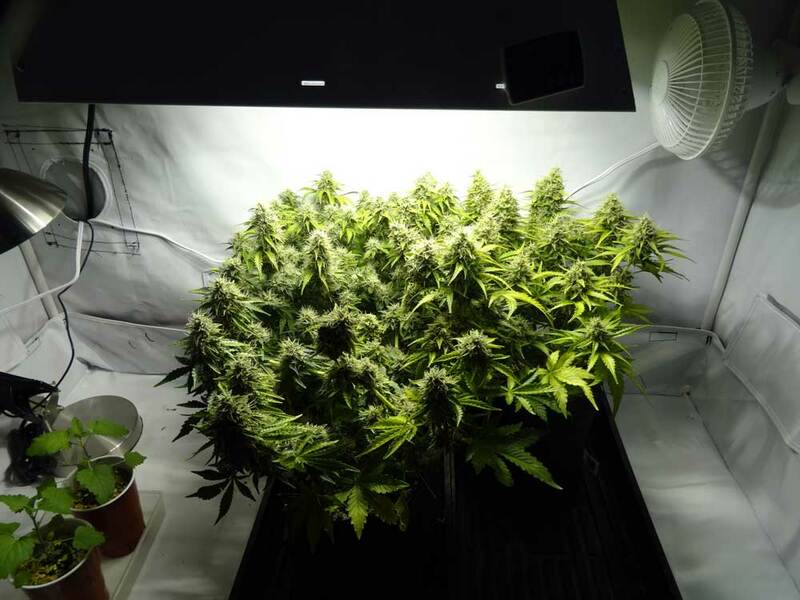 Auto-flowering Grow Journal - 6.7 oz under 250W HPS! 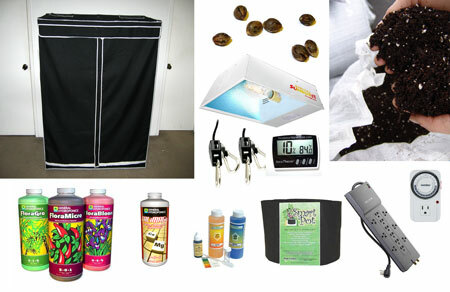 Supplies - Get Everything You Need to Copy This Grow! 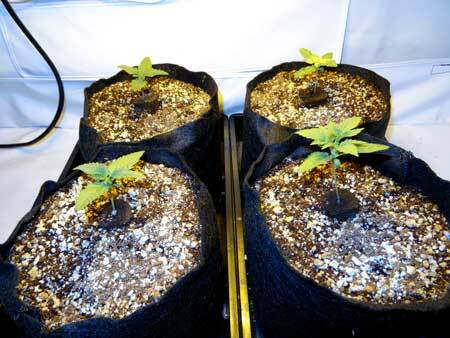 4 x 2-gallon Smart Pots - I should have gotten bigger containers, maybe 7 or 10-gallon, with just 1-2 plants. I had to water these ones all the time. But I wanted to stuff 4 plants of different strains in there even though it wasn't the logical thing to do. Exhaust: Strong tabletop fan above tent (I also used a window fan pointing out if the room got hotter than outside) - temps around 78-83°F even without a real exhaust because the light is so small. Here's the nutrient schedule I used (PDF) (it's basically the regular GH schedule for the Flora trio, but I cut the dosages in half and converted everything to imperial measurements (tsp, etc). 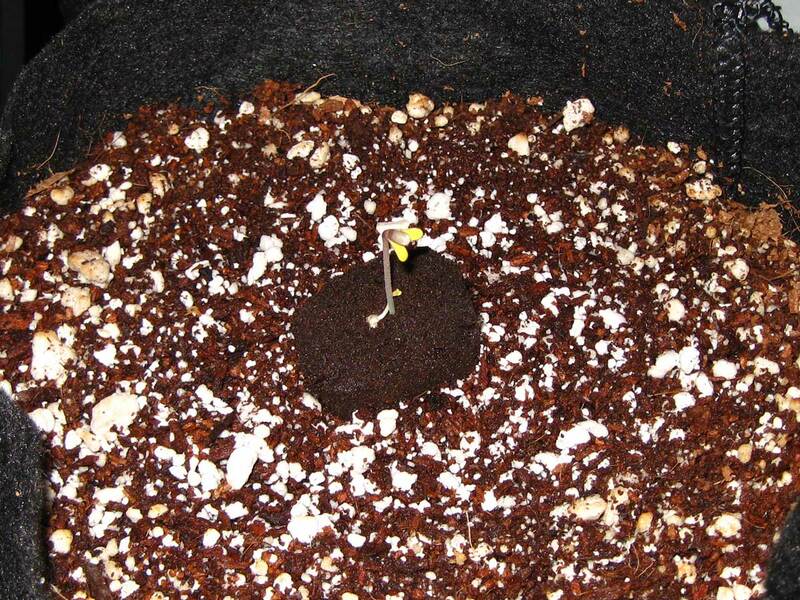 You can use this schedule exactly as is for growing cannabis in coco coir. 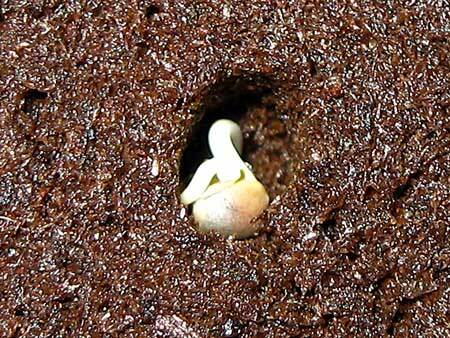 When the leaves appeared, there were two different distinct sprouts - "twins." I've heard of this happening before, but it was kind of neat to see it in person. At this point, I didn't realize the main sprout was a tri-leaf plant. 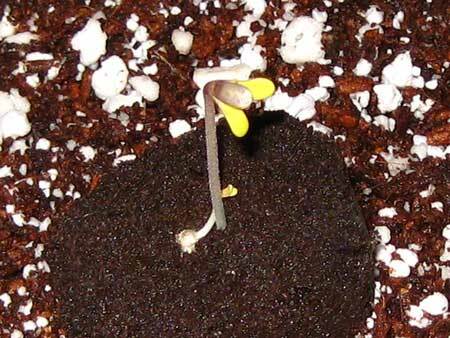 As you can see if you look above, there are three cotyledons (round leaves) on the tall seedling, while the tiny seedling only has two. 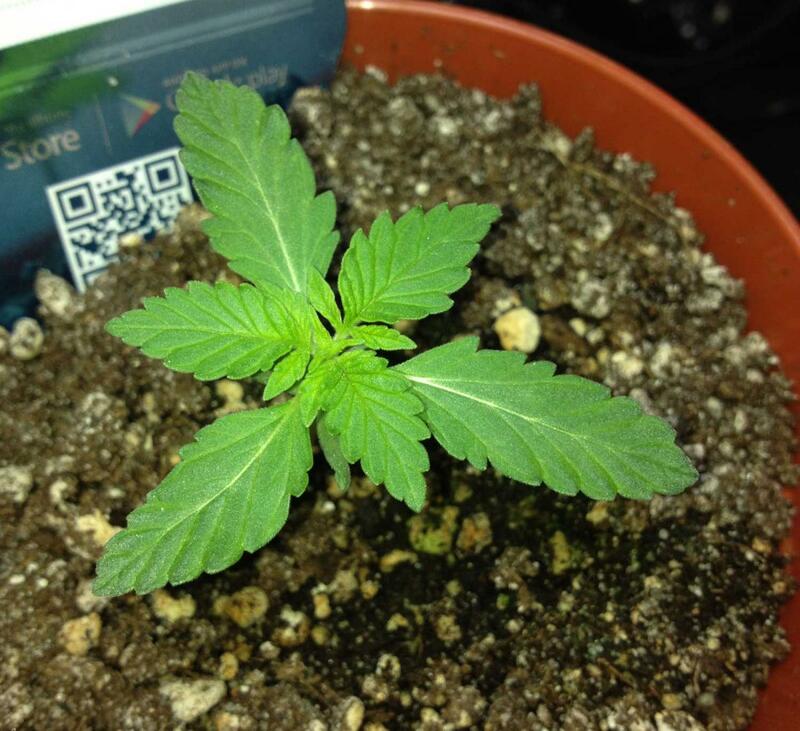 Here's the Jack 47 tri-leaf at the end of week 1 - it has three leaves at every node instead of just two. It's beautiful isn't it? At this point I'm hoping that extra leaves at each node will end up with more bud. I thought it would grow out of it, but by the end of week 2 I decided to check the pH of the runoff (which I should have been doing the whole time) and saw that the Sour Diesel's runoff was way too high. 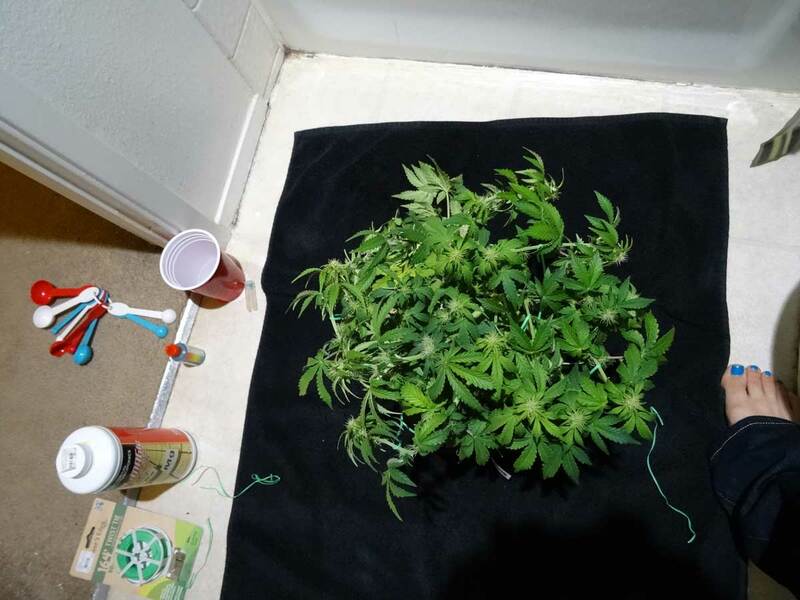 I started giving nutrients at a 5-5.5 pH every time I watered the Sour Diesel plant until the runoff started coming out around 6. I think it took a week or two. I also started giving more CaliMagic, now at 1/2 tsp/gallon every watering. 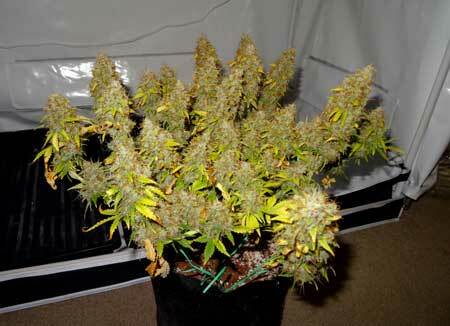 As you'll see the yellowing eventually clear itself up after a while with the Sour Diesel. Left - strange whirled cola. Right - now is a normal cola with 2 leaves per node. I did more LST on all the plants this week, though the Sour Diesel is just pulled over a bit since it's smaller than the others. When I started LST'ing the main stems down and away from the center of the light, my idea was I wanted to break the apical dominance (the tendency of the plant to grow just one main cola) by depriving the main colas of light. 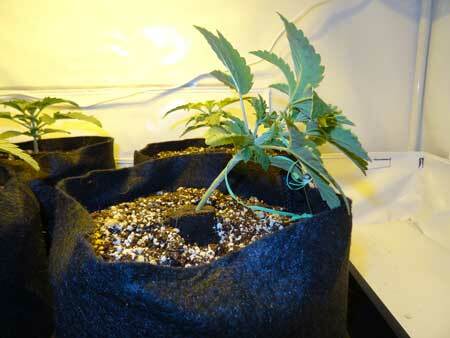 My hope was that if the main cola didn't have enough light, this would cause the lower branches to become main colas. My idea was to do this instead of Topping or FIMing (pinching/cutting off the tip) the plant, which is how I would normally start a plant training regiment, but I didn't want to cut these plants since they were my first autos and everyone tells you not to cut autos. Well, as you'll see in a little bit, this strategy of bending away from the light to break apical dominance did not work for any of the plants. These autos appear to have an incredibly strong apical dominance. 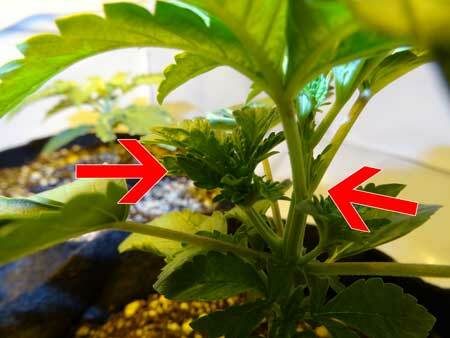 Even when the main colas were deprived of light, the plant still focused on them instead of the side buds. So in the end I actually bent the main colas back under the light. 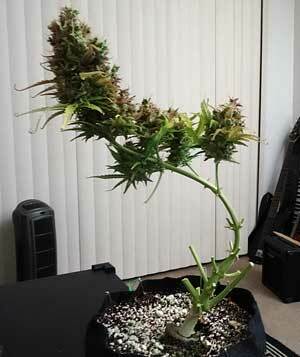 You'll see the crazy bending I did when you see the plants' "skeletons" after harvest. We had a crazy heat wave this week, and I kept accidentally overwatering the plants to make sure they didn't dry out, and to help them cope with the dry heat. They are looking a little droopy but still growing fast. 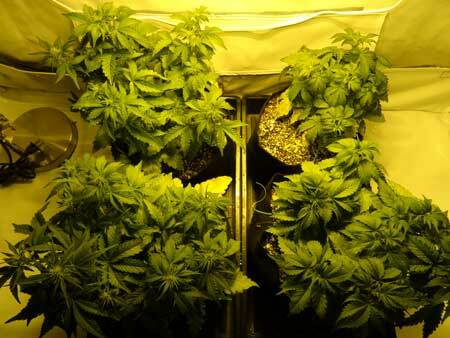 Here they are at end of Week 4 - still droopy but growing fast! Some of the plants are starting to stretch and I've bent the plants down wider to keep things flat. 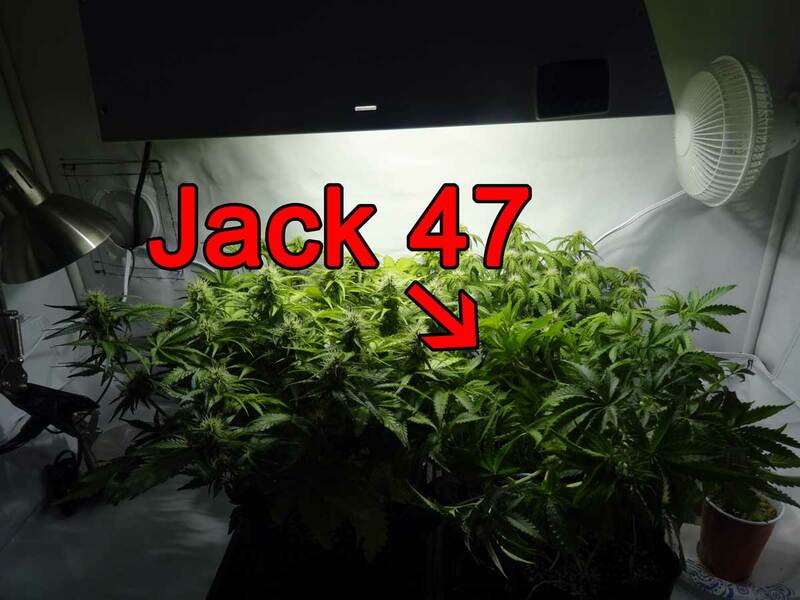 Jack 47 shows a few pistils. At this point I'm hoping it's just going to flower a little later than the others, but considering how weird this plant has been so far with the twin seedlings, the tri-leaf and the splitting of the main cola, I'm not holding my breath. I installed a webcam last week, and I'm using this lamp (with a heavy base) to hold it up. There's no light bulb, I'm just using the frame to hold up the webcam. They're really starting to stretch now! The two on the left (Blue AutoMazar and Critical Jack) have really taken off and started producing buds. The Sour Diesel is catching up, and the Jack 47 in the front right hasn't grown any buds yet. 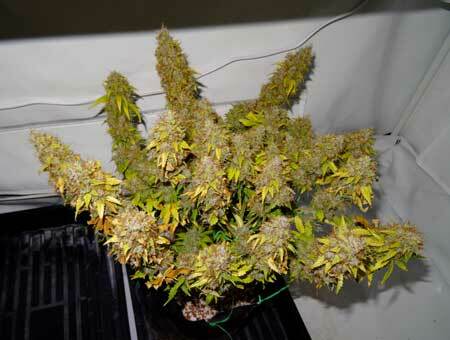 The Sour Diesel plant is still suffering from yellow new growth, like it has from the beginning. 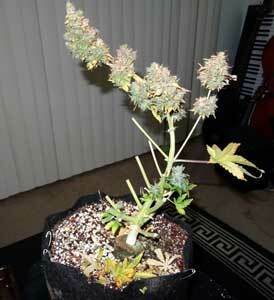 But it is now growing vigorously and I had to do some LST to keep the height down. The buds are also beginning to form. We'll see what happens next with this plant! Tossed the Jack 47. 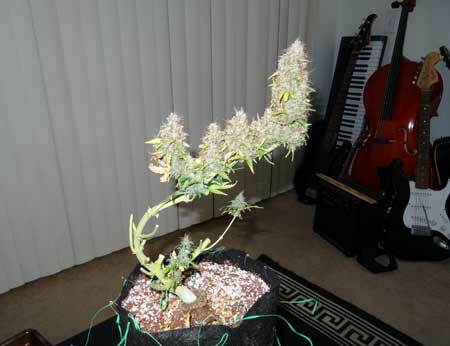 It wasn't making buds yet, and still just had a few hairs/pistils around the joints. It has been a thorn in my side the entire grow. At this point, I decided it was just a waste of space. Even if it started flowering immediately, it would still be 4 weeks behind the others, and honestly I was a little annoyed with the plant. I felt a sense of relief when I threw it away. 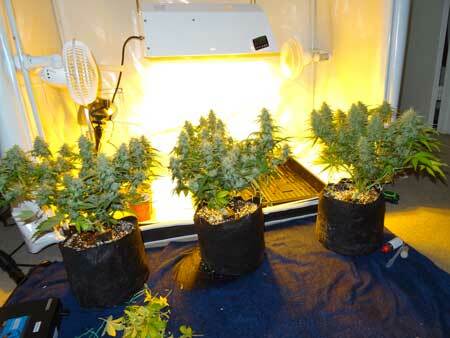 It's SMELLY in the grow room this week. I've just invested in some ONA blocks for the living spaces in the home to keep any guests from being assaulted by the smell of cannabis when they come through the door. ONA products are extremely good at getting rid of odors and replacing them with a clean ONA scent. 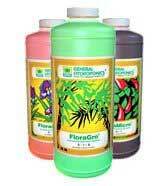 The only thing to keep in mind about ONA products is they can't share air with your flowering plants. 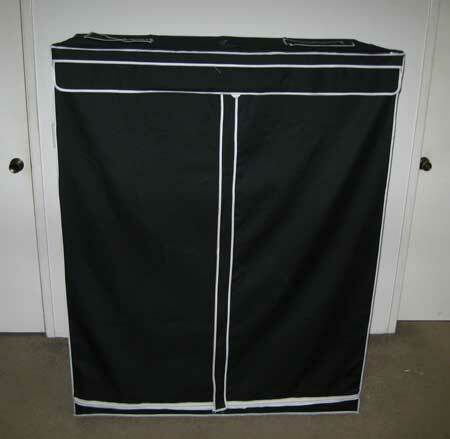 For example if you put an ONA product in your tent with your flowering plants, all your buds with smell/taste like perfume after harvest, because the ONA is removing their natural smell and replacing with ONA smell. The perfume smell never goes away - it's permanent, even after months and months. I learned this one from experience a few years ago, so don't make the same mistake I did! Here's the stem after I cut it off the plant, and it smells! 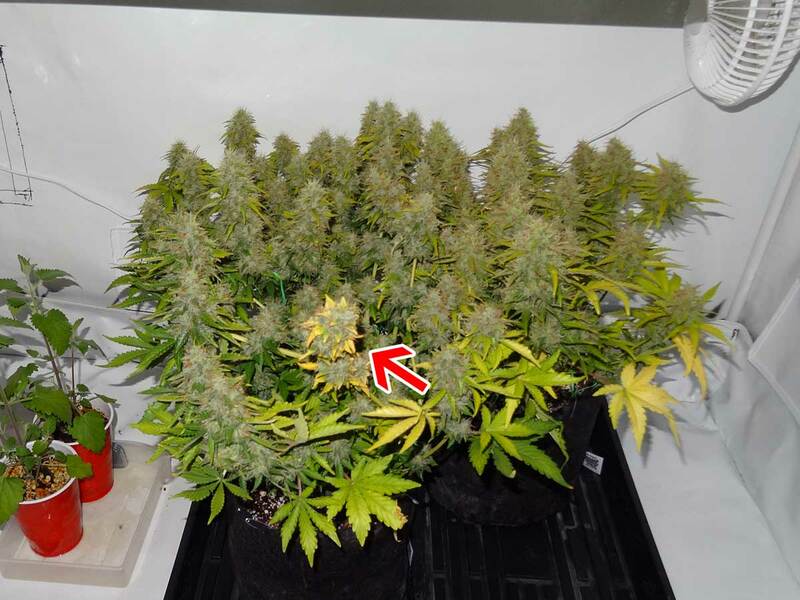 In fact the whole grow space is INCREDIBLY stinky with this grow, worse than any other grow I've been through. I wasn't sure which plant was the culprit, but after bringing this one small stem downstairs, it stunk up the whole floor. 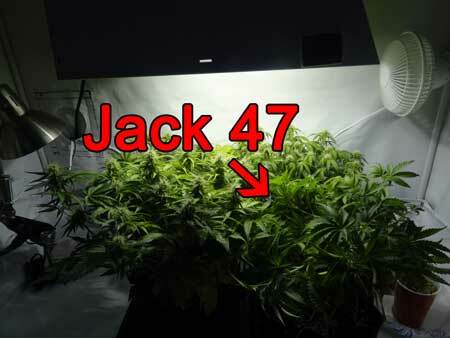 Now I'm pretty sure it's this Critical Jack that is making the entire grow space reek of fuel. Here's another closeup. Make sure you click on the pic so you can see the full-size and zoom in! I took a macro shot so you can see all the trichomes. 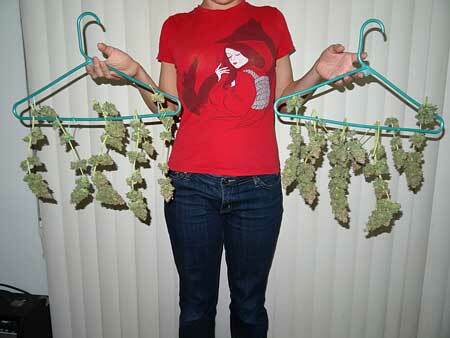 Finished drying the extra nugs from last week. I dried it for several days on the stem, and I think I may have overdried them a little bit, but c'est la vie. It's important that there's a little moisture for the curing process to happen properly, so I'm hoping there's still some moisture in the middle of the buds that will work its way to the outside during the cure. In the tent it's mostly just watering and waiting. 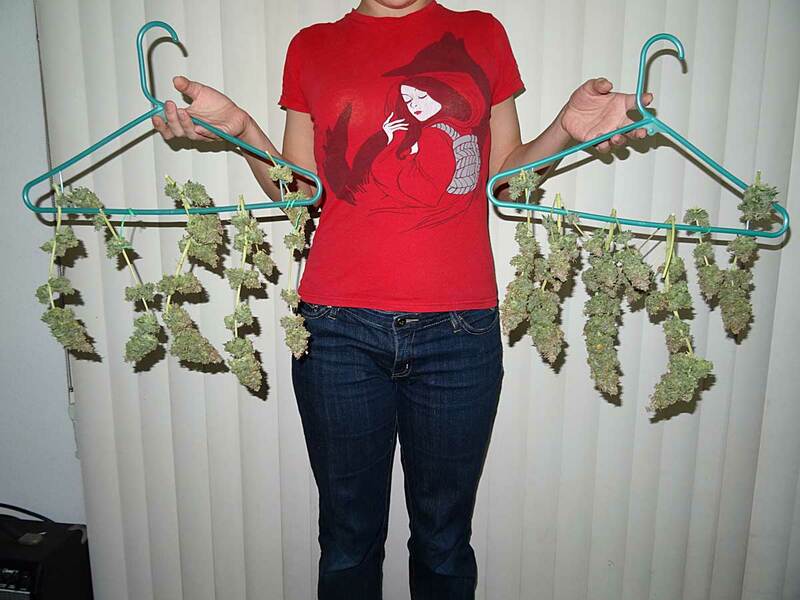 Unless I run into some sort of problem, there's not much left for me to do until harvest. 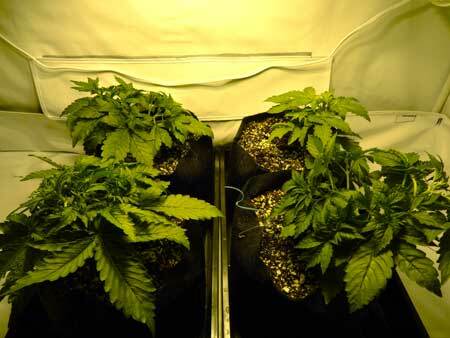 As we get close to the end, each plant is about 1'x1', and about 18" tall when you include the 2-gallon pots. All 3 of the plants are about the same width and length because I trained them to grow in that shape with LST/bending. They could have been a different shape/width/length if I'd trained them to be. 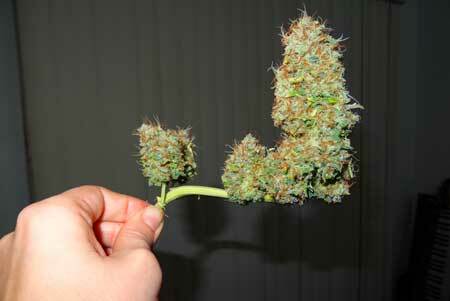 This shows the "structure" of the plant. 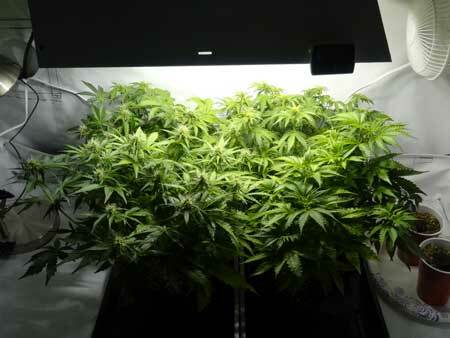 I used LST (bending) to train the plant to be short to take the most advantage of the 250W HPS grow light. The structure of the plant "under the hood"
Altogether, the Blue AutoMazar plant yielded 66.7 grams, or about 2.3 ounces. 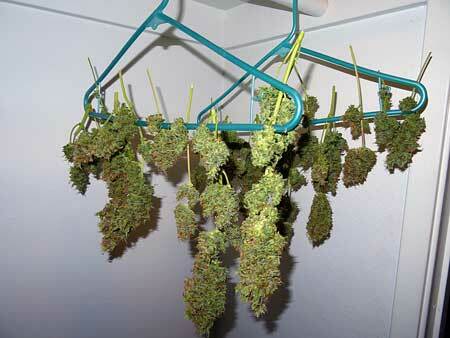 These buds were lighter and more airy than the other buds. Potency: Body effect, medium potency as far as pure power. 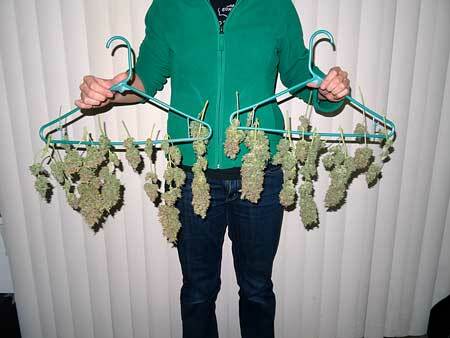 These buds were the least "strong" of all the buds harvested. 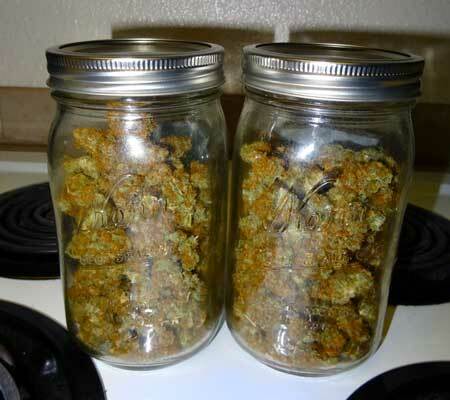 These buds are relaxing and calming. I think this one would be a good one for anti-anxiety. It didn't make me tired, but I felt relaxed and at peace. For me this strain is great for relaxation and pleasant introspection. 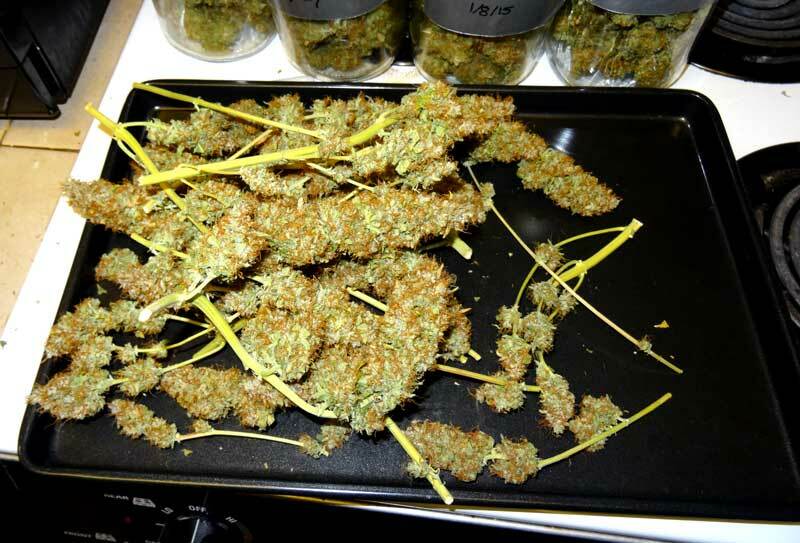 Taste/Smell: Sweet and soft but not fuity, these buds don't have a particularly strong scent, and they don't really smell that much like cannabis. They don't have a "skunkiness" to them at all and smell like some other unidentified scent. 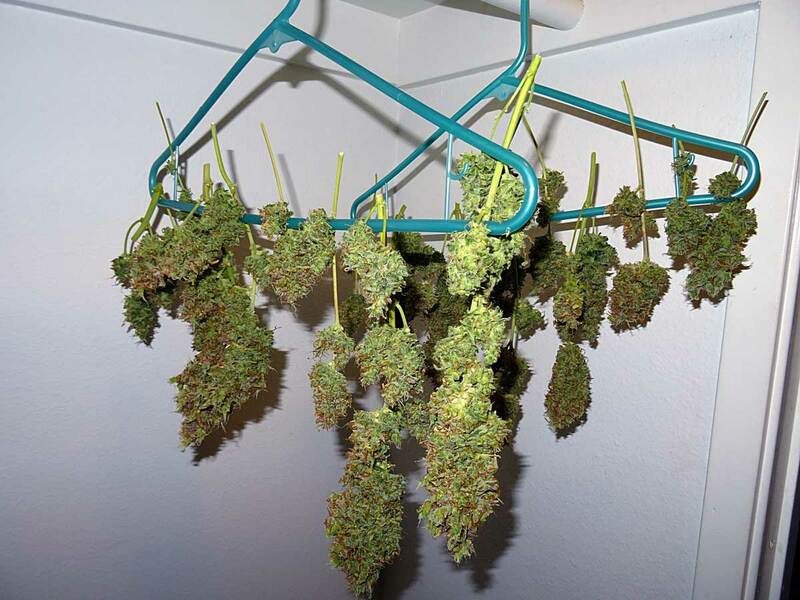 It might be a good strain for a stealth grow. 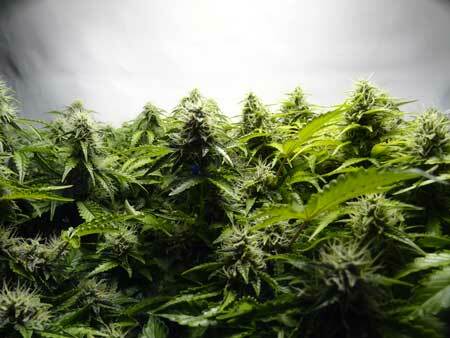 Potency: Body/mind effect, high potency. 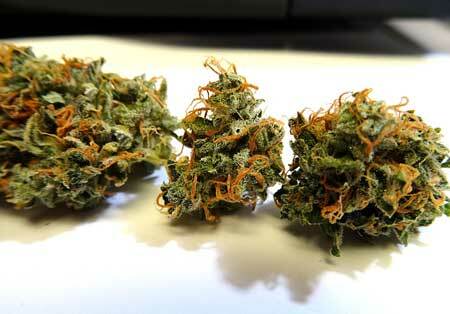 This one is about equal to the Sour Diesel when it comes to pure "strength." 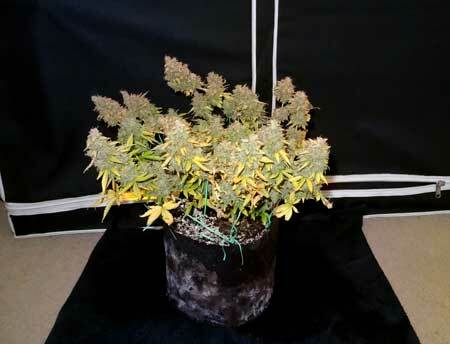 I'd say the buds are comparable to photoperiod strains. 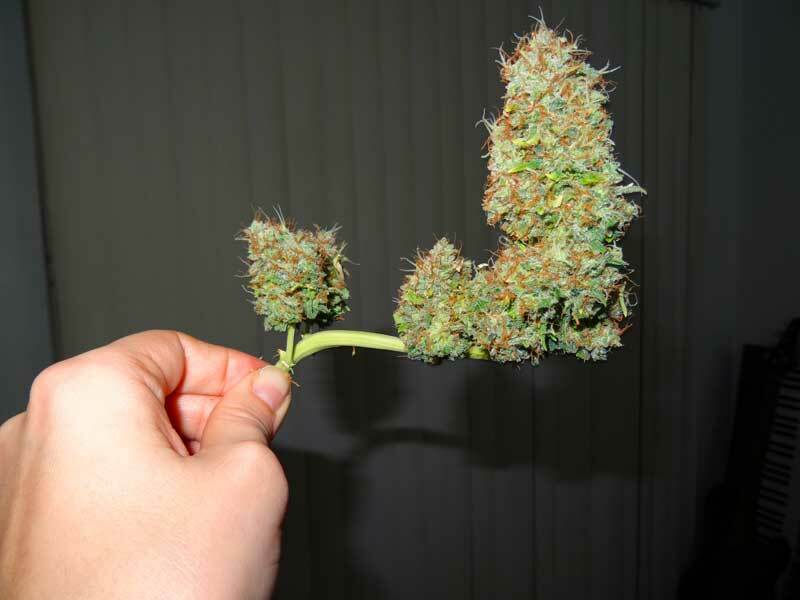 These buds have a tingly body effect that eventually moves up to your head, too. This one made me feel really good physically. I think this one could be a good choice for pain, spasms, stress or tensed up muscles. 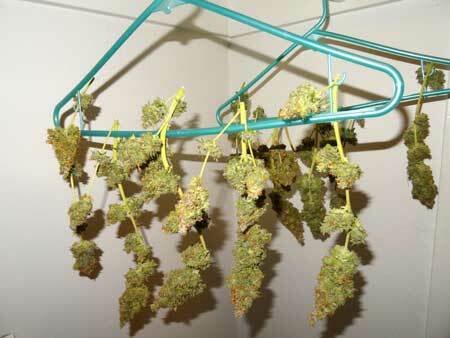 Here are the buds after they've been dried. Altogether, the Sour Diesel plant yielded 63.6 grams, or about 2.2 ounces on 1/15/14. 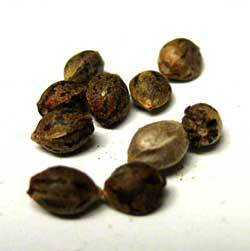 Potency: Body/mind effect, high potency. 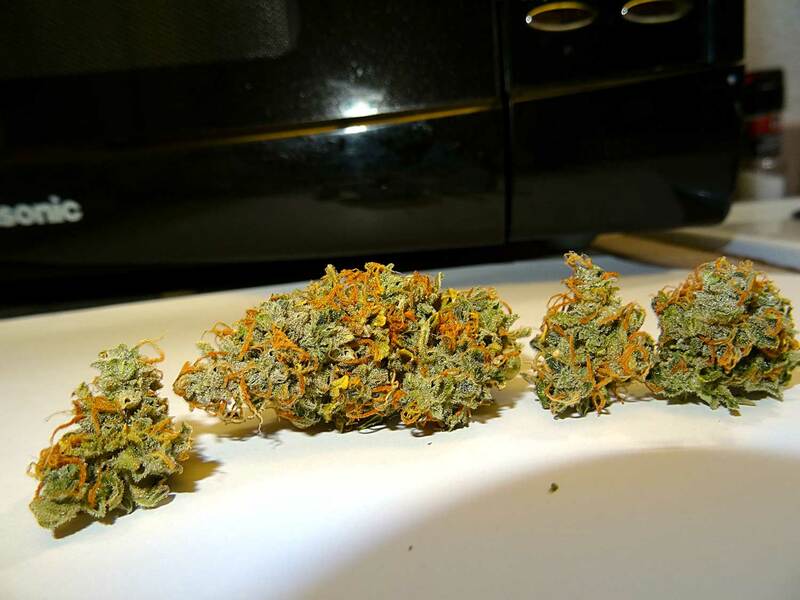 These buds were tied with Critical Jack as far as the potency, and could compete with the photoperiod strains we have in the house as far as pure strength. Very strong initial head/body effect - I found myself putting hand to my head after I tried it ("headband"). This one was good all over and had really strong mental and body effects. I think this one is the most "recreational" of all the plants I grew. 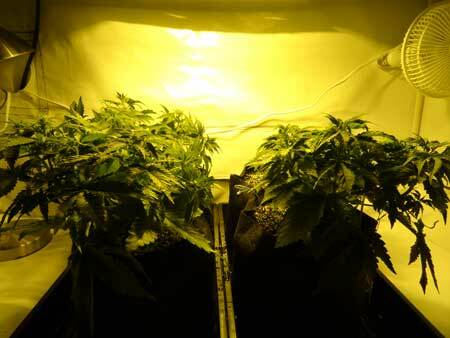 Before this grow, I'd never grown any auto-flowering strains. This was an adventure! 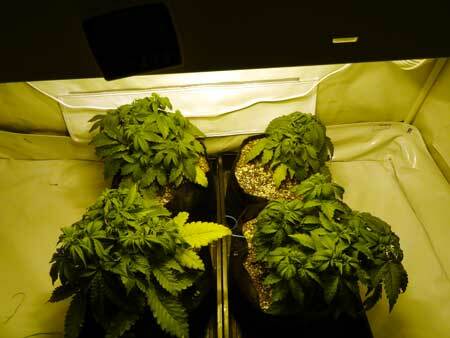 I've grown photoperiod strains for years, and I always wondered what these auto strains were like. I thought it might be helpful for other growers to learn some of the things I noticed throughout the grow. 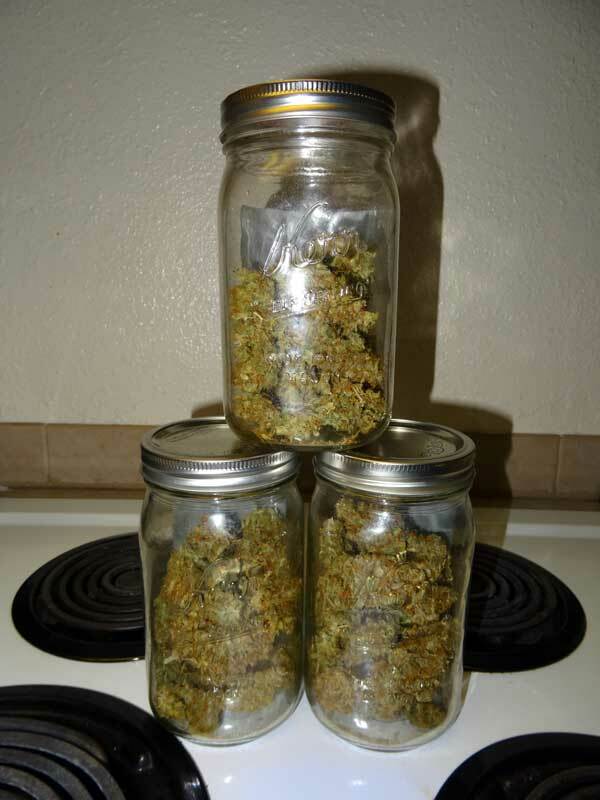 Short harvest! 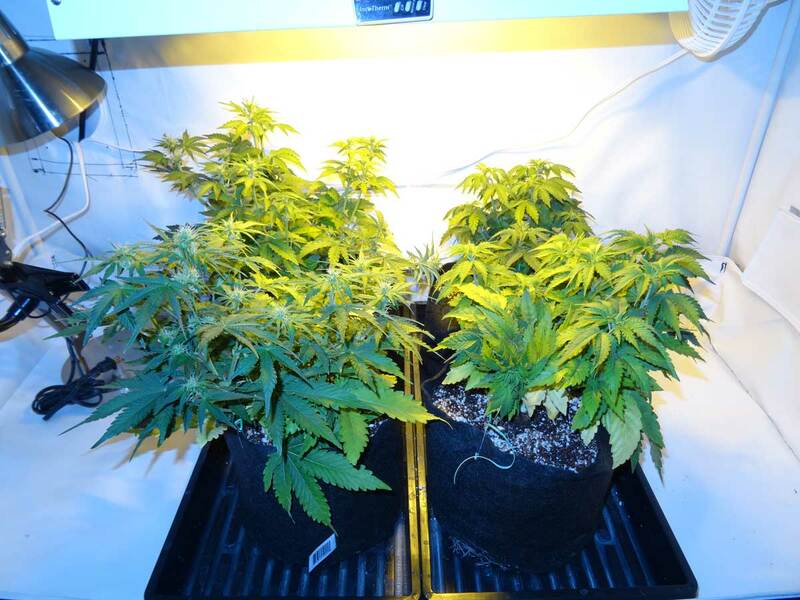 I planted these on Oct 13, 2014, and harvested the first plant before New Years! 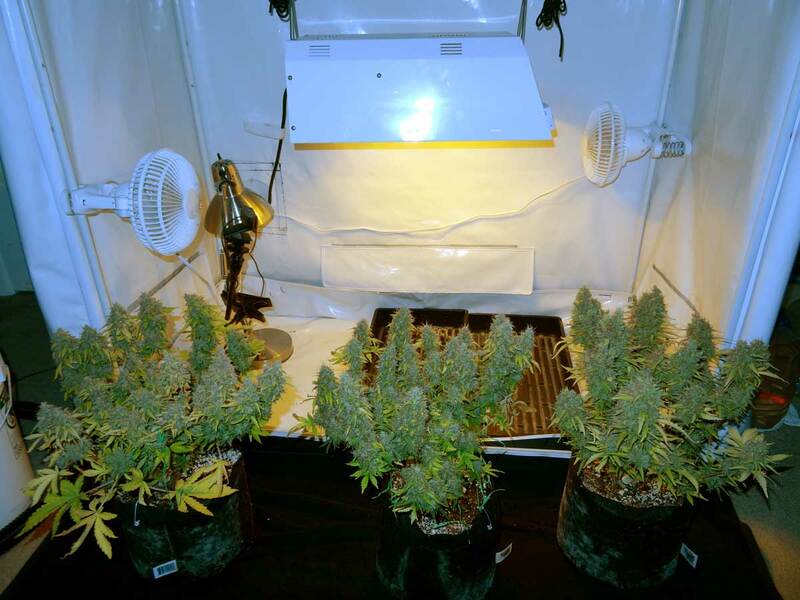 With these auto-flowering plants, I was able to harvest 1-2 months earlier compared to growing with photoperiod strains - it felt crazy how fast harvest came. If you need cannabis fast, than growing autos is definitely the way to do it. Light Schedules - No need to worry about light schedules or light leaks, though this didn't really make much difference to me since I was already growing in a tent, and changing the timer to initiate flowering only takes a minute or two. 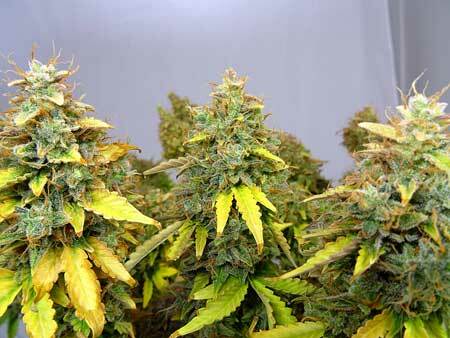 Medicinal Qualities - These buds felt more medicinal than the majority of strains I've run into. 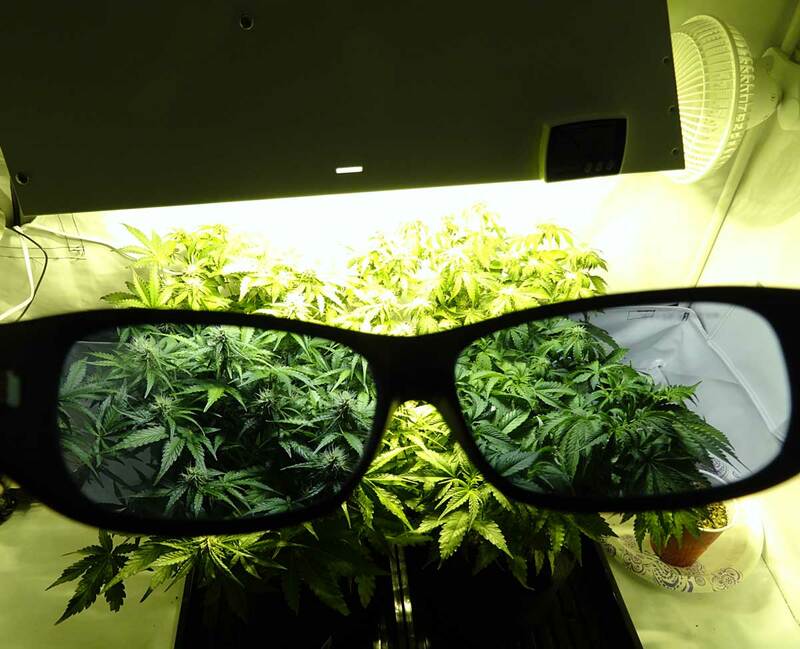 This may be because auto-flowering cannabis strains tend to have much higher levels of CBD than most high-THC photoperiod strains. Learn more about THC vs CBD. 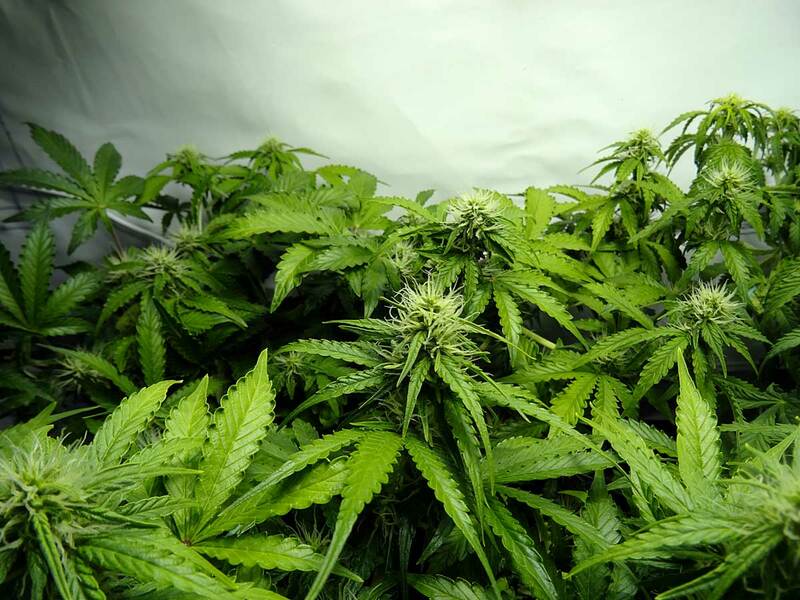 Even after enjoying a lot of buds at once, the effects weren't as "racing" as some of the really high-THC, low CBD strains, and I think some people might actually prefer the effects of the auto-flowering buds. They all made me feel very pleasant and helped melt away stress, without being overwhelming. I like that with these strains I'm able to build up the positive effects as much as I want without running into adverse effects or feeling like it's "too much." 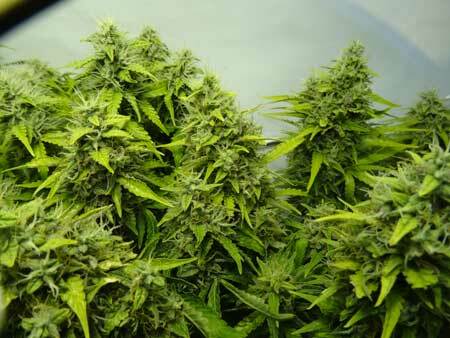 I think autos might be a good choice for many medical marijuana patients. Some Strains Have Lower Potency: I think growers need to be aware that some auto-flowering strains may not be as hard-hitting as many of the photoperiod strains. 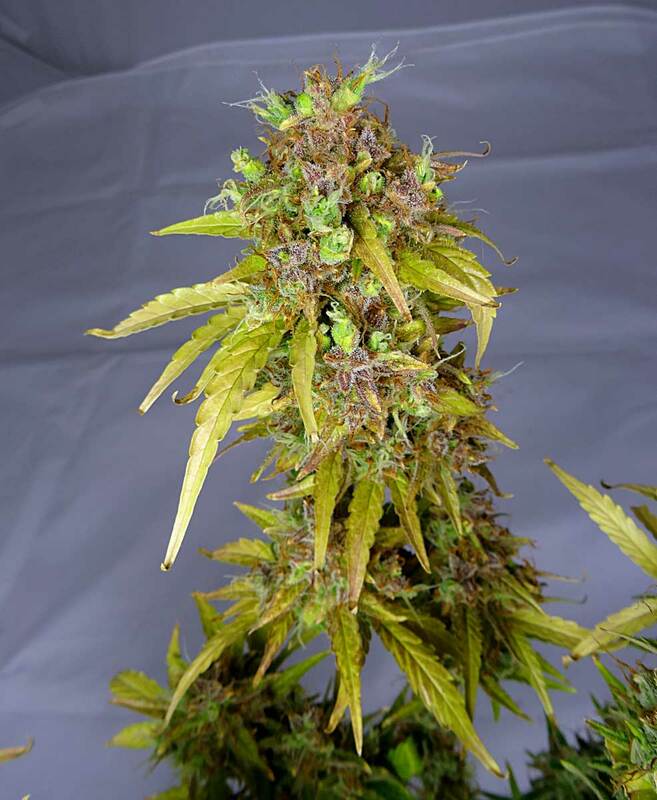 For example the Blue Mazar produced really great effects; it's great for relaxation while allowing me to still be functional, but I'm not sure this particular auto-flowering strain would be a good choice for someone seeking mind-bending buds for recreational use. 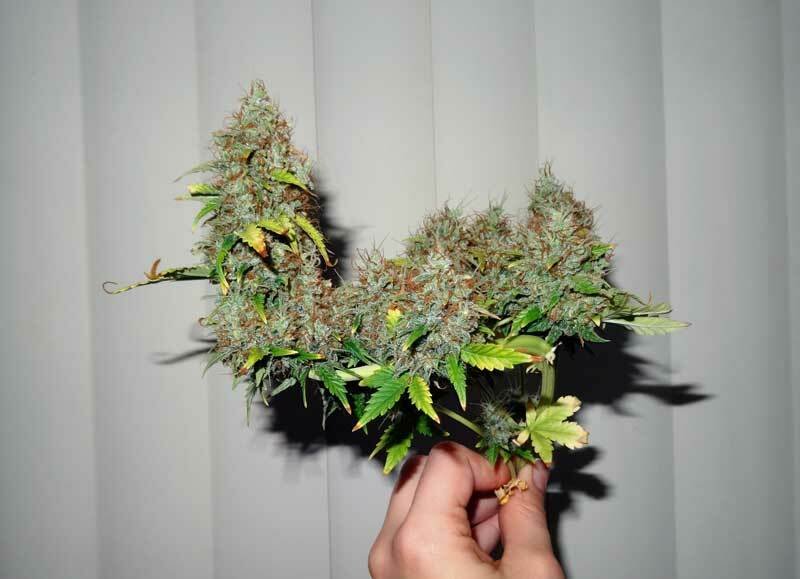 Bud Structure: If you're looking for the most eye-catching buds that will win the next beauty contest, than autos are probably not for you. The buds I grew weren't as sparkly as the best photoperiod strains, though they were still very pretty. They also seemed to have a slightly different structure than most photo plants; they generally had more and larger sugar leaves (which I assume helps the plant grow vegetatively even while it's making buds) but that makes them look leafier than photoperiod buds. No Control Over When Flowering Begins: I didn't like the lack of control caused by the auto-flowering trait. 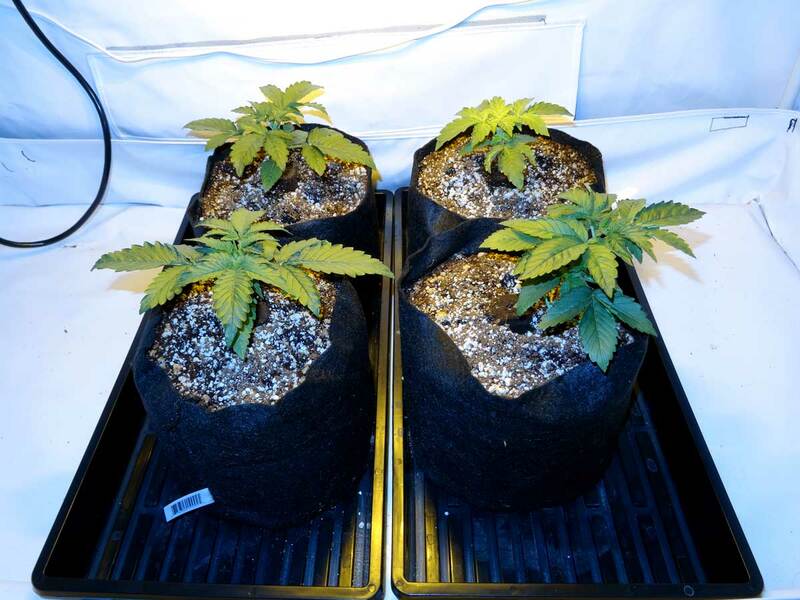 For example I had to toss one of my plants because it didn't auto, and I believe that lowered my final yields because there was a "hole" in the canopy I'd created, so that extra light was being wasted. With photoperiod plants, you can get all the plants to flower exactly when you want, even if they're different ages or sizes, so that particular problem could never happen in a photoperiod grow. 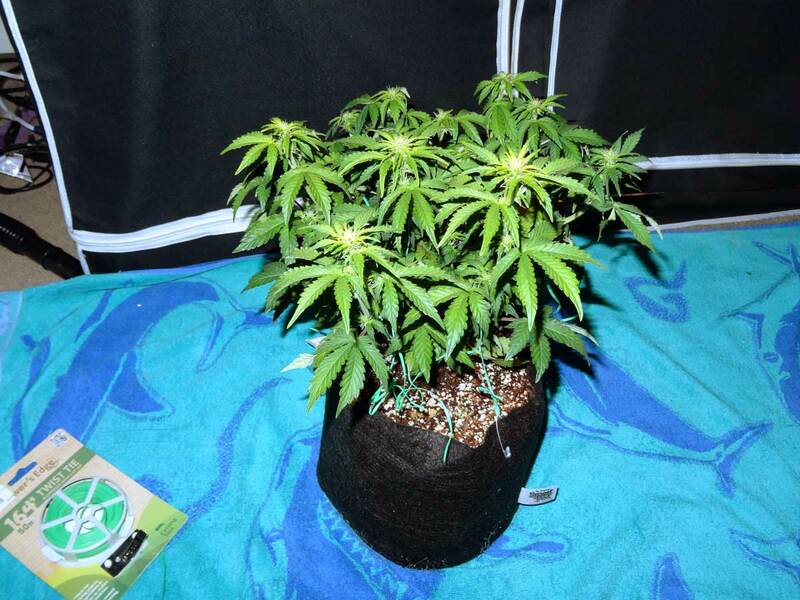 Training - Any LST Happens in the Flowering Stage: After week 3 the plants had buds growing on them, so when it came time to do a training/bending session, I was worried about bumping into or crushing buds while I was trying to bend the stems. It worked out okay in the end, and I'm very happy with the results, but the whole time I felt like I was actively trying to avoid injuring any of the fledgling buds. It felt stressful. I like how with a photoperiod plant you do your training in the vegetative stage, when the plant is hardy and almost impossible to truly injure. 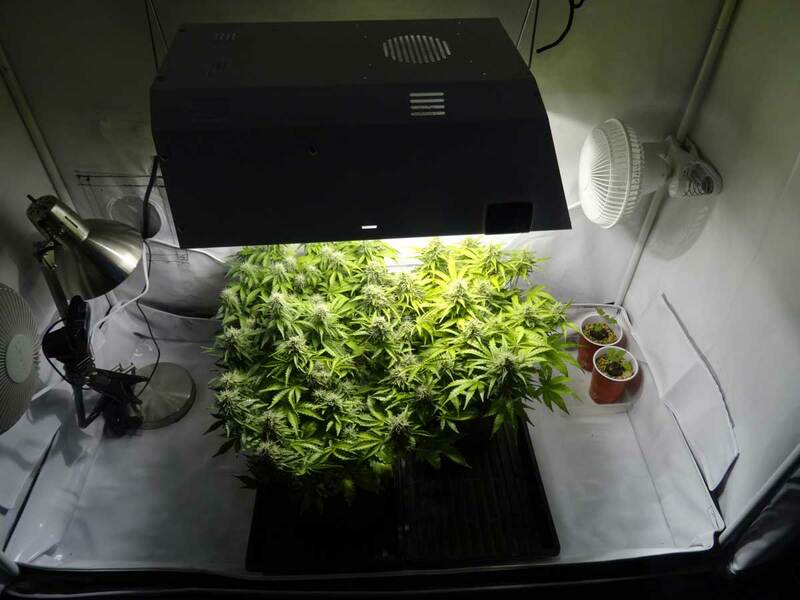 You can drop your light on a photoperiod plant in the vegetative stage and it will recover just fine, but with the autos I felt I had to be a lot more gentle when it came to training. Many growers recommend that you shouldn't train autos, and should just let them grow naturally, and I do believe that would have made things a lot easier, although it would probably lower the final yields. Nutrients - Full strength nutrients (based on the schedule by General Hydroponics) was way too much, even with several plain-water waterings in between. I ended up using the GH nutrient trio at half strength, and I only gave nutrients every 2nd or 3rd watering, with plain pH’ed water the rest of the time. I didn’t seem to have any problems when I altered to half strength. I do recommend adding an extra plain water watering in hot weather, or if you see any sign of tip burn. Here's the exact nutrient schedule (PDF) I was using at the end. It's nothing special, just the regular General Hydroponics schedule at half strength, and converted into imperial measurements (tsp instead of ml measurements). Light - If I could do it again, I'd get a 250W HPS light with a bigger reflector and separate ballast. I originally wanted a 250W HPS with a wing reflector, but I couldn’t find exactly what I was looking for in my price range. I ended up getting this 250W with built-in ballast, and it’s convenient because it’s plug-and-play, but it has a reduced light footprint compared to a dedicated reflector. 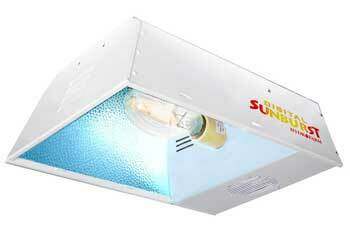 In other words, a wider reflector would create a bigger area that has usable light. I think the buds on the edges of this grow would have gotten more light if I’d used a wider reflector. 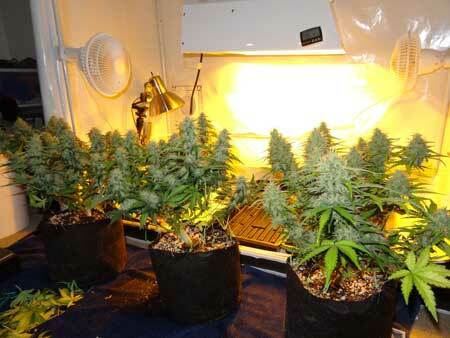 I also think it might have been a little cooler in the tent if the ballast could be kept outside the grow area. Still, I am very impressed with this light and I don’t plan to trade it in or buy a new one. The built-in reflector, and the temps were completely adequate for my needs. 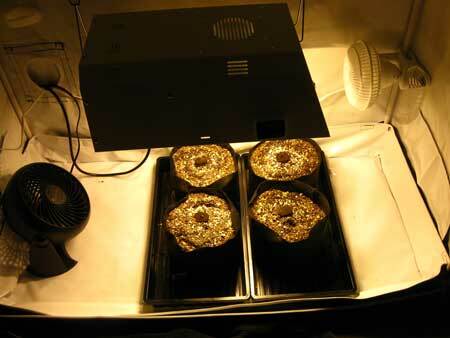 # of plants - Next time I'll only grow 1-2 plants in this setup. I believe that 4 plants was too many. Honestly, I knew this was the case when I started out, but I really wanted to harvest 4 different strains instead of just one or two. I think 1-2 plants would have been ideal under a 250W HPS, and I think growing just one plant would have yielded more overall compared to having multiple plants. In case there’s trouble with one plant, maybe start with a few, and you’ll have some to cull if you run into trouble. 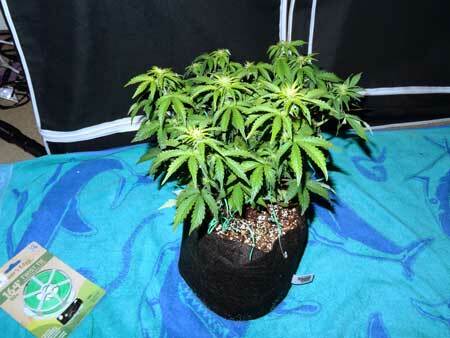 Pot Size - 7 or 10-gallon smart pots. The 2-gallon smart pots were too small for this grow. I ended up having to water the plants every other day and sometimes daily when it got hot or dry. The frequent watering was needed because the pots were too small to hold enough water to last the roots a few days. 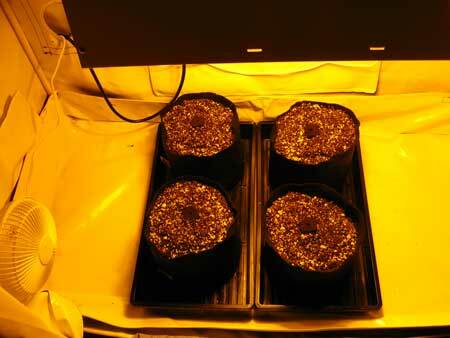 Part of why I chose such small pots was to fit the 4 plants inside this tent under the grow light. If I could do it again, looking for the best yields and easier watering, I would do one plant in a 10-gallon smart pot, or perhaps two plants in 7-gallon smart pots. 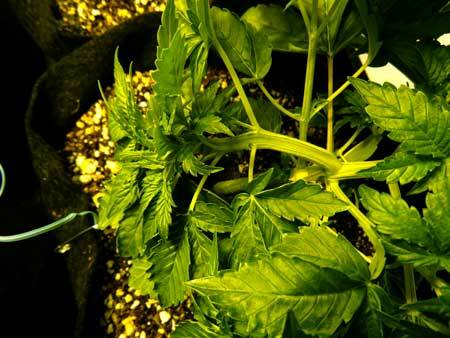 I always train my plants for better yields, but with auto plants everyone warns you not to use any cutting or high stress training techniques like topping or pinching/FIMing because their veg stage is so short they don't have time to recover. 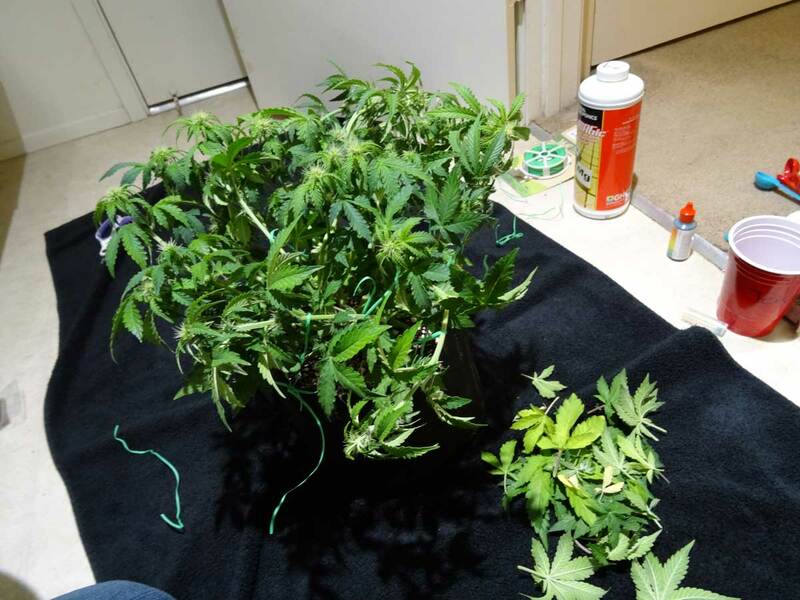 So without cutting techniques, if I wanted to train the plants I was only left with Low Stress Training (bending stems to the plant grows in the shape you want). LST is a great cannabis training technique, and increases your yields dramatically even when used alone, but it works best when combined with cutting or pinching off the top of the plant when the plant is young. 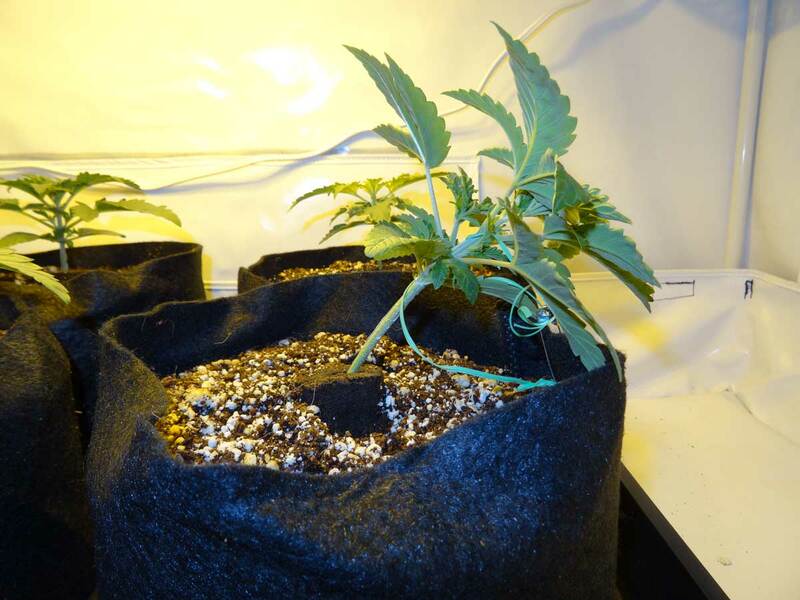 Topping/pinching instantly increases the number of colas/main buds and gives you a symmetrical "platform" to start with, so it annoyed me that I had to work with one main cola that had strong apical dominance. Despite the warnings I've heard from other growers, I wish I'd FIMed (pinched the top off of) these plants when they were young. I'll never know if it would have turned out better, but from what I saw I believe I would have gotten bigger yields if I had broken their apical dominance from the start. 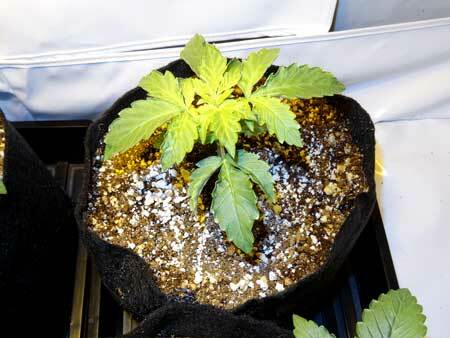 If I had to do this again, I would FIM the plants when they have about 3-4 nodes (but only if the plant was growing vigorously, if it was struggling like my Sour D was at the beginning, I would leave it alone until it was healthy). FIMing does not slow down growth much in a healthy plant, and I believe that would have made training much easier (less time needed on the grower’s part doing intricate LST) while making multiple main colas for bud-making. 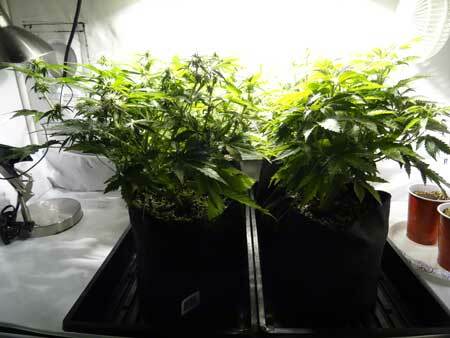 I think it would have been easier to spread out each plant under the light if it had more colas right from node 3 or 4. But if an auto-flowering plant is struggling or slow growing, I think it's incredibly important to avoid any type of high stress techniques! It will definitely stunt your plant. Every time you stress an auto-flowering plant, you slow down growth to some extent. That means you're losing that time forever since these plants have a set number of days to live - it's a fight against the clock! I believe you have to find a smart balance of finding just the right type of stress to make a better plant structure, but not enough stress to stunt your auto-flowering plant. I definitely can't recommend anything since I haven't done it myself! 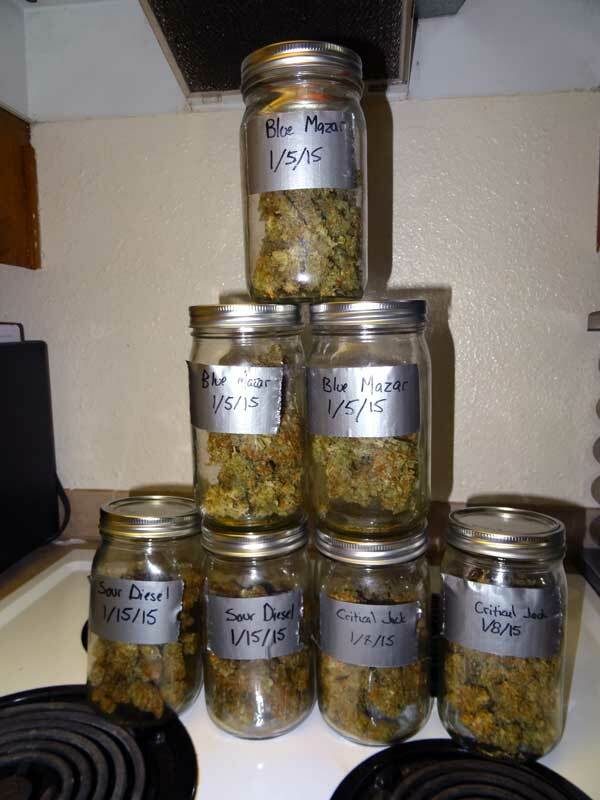 Overall I'm really glad I did this grow and got a chance to try growing auto-flowering cannabis strains. I was initially worried the buds wouldn't be as strong, and I was very pleased to find out the potency of the two Dinafem auto strains were as good as the photoperiod strains we have in the house. 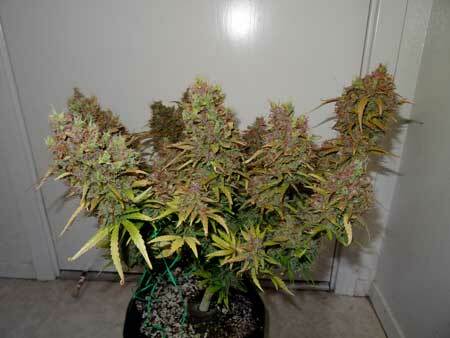 Auto-flowering strains have really come a long way from the original "Lowrider" strains when it comes to potency! I think auto-flowering strains are the perfect choice for a lot of people, especially medical marijuana patients, people who don't have time to train their plants, or those who need a harvest soon. 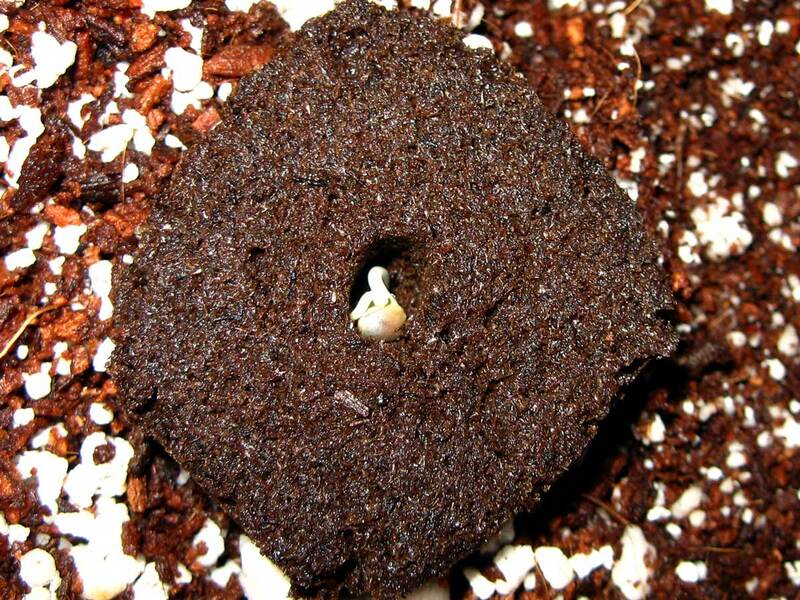 But for me the downsides outweighed the upsides, and although I'll probably visit autos again in the future, I'll be a growing a photoperiod plant for my next grow!